We thank thee, Lord God, for all the benefits thou hast given us in thy Son Jesus Christ, our most merciful Redeemer, Friend, and Brother, and for all the pains and insults he hath borne for us; and we pray that, following the example of thy saintly bishop Richard of Chichester, we may see Christ more clearly, love him more dearly, and follow him more nearly; who liveth and reigneth with thee and the Holy Spirit, now and for ever. Richard of Wyche was born in 1197 at Droitwyche, the son of a prosperous yeoman farmer. He and his brother were orphaned at an early age, and an incompetent guardian wasted the inheritance. Richard worked long and hard to restore the family property, and when he had succeeded, he turned it over to his brother and went off to Oxford to become a scholar. He was too poor to afford a gown or a fire in winter, but he did very well at his studies, with Robert Grosseteste among his teachers, and he established what would be a lifelong friendship with his tutor, Edmund Rich (Edmund of Abingdon). He studied canon law at Oxford (and probably also at Paris and Bologna) and, having acquired a doctorate, he became Chancellor of Oxford in 1235. Meanwhile, his tutor had become Archbishop of Canterbury, and soon asked Richard to become his Chancellor. 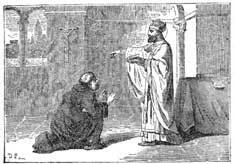 When the Archbishop rebuked King Henry III for keeping various bishoprics vacant as long as possible (because as long as they were vacant their revenues went to the Crown), Henry forced him into exile, and Richard accompanied him to France and nursed him in his final illness. After the Archbishop's death in 1240, Richard studied at the Dominican house in Orleans, and was ordained priest in 1243. In 1244 he was elected Bishop of Chichester, but Henry would not recognize the election, locked him out of the bishop's residence, and pocketed the revenues. Richard accepted shelter with a village priest, and spent the next two years walking barefoot through his diocese, preaching to fishermen and farmers, and correcting abuses. He held synods to legislate, and insisted that the sacraments must be administered without payment, and the Liturgy celebrated with reverence and order. The clergy were required to be celibate, to wear clerical dress, and to live in the parishes they were assigned to and carry out their duties in person. The laity were required to attend services on all Sundays and holy days, and to know by heart the Lord's Prayer, the Hail Mary, and the Apostles' Creed. After two years, Henry was pressured into recognizing Richard as Bishop, but Richard continued to live as he had before.